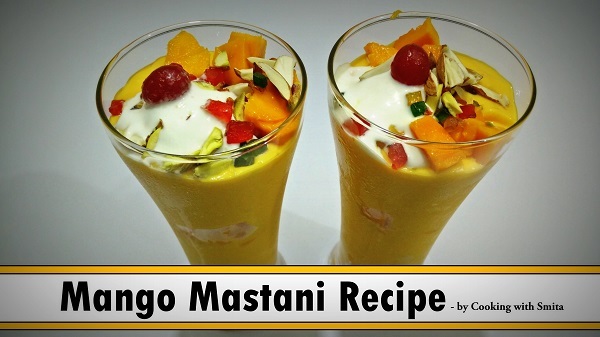 Here I am sharing one of the most popular Mango shake recipe – Mango Mastani. It is originated in Pune (a place in Maharashtra). Learn how to make delicious & tempting Mango Mastani / Mango Milkshake at home. A quick & easy recipe. Cut Mango in small pieces and add in Mixer Jar. Add Powder Sugar, full-fat Milk, Ice Cream and blend till smooth & thick Milkshake. Add some chopped Mango in serving glass. Pour Mango Milkshake in the serving glass till half. Add some more chopped mango. Fill the glass with Mango Milkshake. Garnish with 1 scoop Ice Cream, some more chopped mango, Tutti Frutti, Dry Fruits & Cherry. Mango Mastani is Ready to serve.